In 1940, Julio Alpuy registered in the Taller Torres-García, where he started his studies and put into practice the artistic ideas of the workshop’s founder, Joaquín Torres-García. In 1943, Alpuy began the series Chimeneas, in which he isolated different elements from the urban landscape, showed them in their basic form, and displayed his notion of abstraction, which did not imply the absence of representation but rather the extraction of the essence of certain concepts. The following year, he participated in decorating the Hospital Saint Bois of Montevideo with two murals. In his figural scenes and still lifes from the end of the 1940s, he constructed objects with vertical and horizontal lines that resulted in flat shapes imbued with primary colors. The death of Torres-García, in 1949, ended a stage in which Alpuy had dogmatically followed the proposals and recommendations of his teacher. At the beginning of the new decade, Alpuy participated in the exhibition Torres-García and His Workshop (Pan-American Union Exhibition, Washington, D.C., 1950) and visited Buenos Aires frequently, where he painted urban landscapes. Between 1951 and 1953, he traveled throughout Europe and the Middle East and then returned to Montevideo and the Taller Torres-García. In the murals and paintings of this period, he introduced complete scenes associated with human activities instead of filling the space with the squared structures containing symbols. Shortly thereafter, the grid disappeared altogether. His peers at Taller did not support Alpuy’s development of “constructive universalism,” so he decided to leave Montevideo. 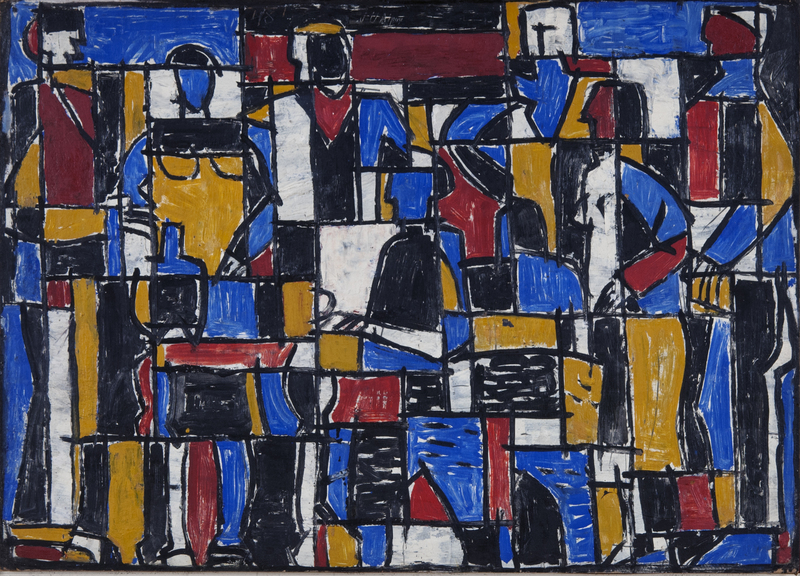 Between 1957 and 1959, living in Bogota, Colombia, Alpuy painted urban scenes and exhibited at the Biblioteca Luis Angel Arango. In these works he combined orthogonal structures with diagonals, giving them a sensation of space without resorting to traditional perspective. In 1959, he spent some time in Dortmund, Germany, whose industrial life inspired him to produce scenes that revealed a new theme. He then lived for a few months in Caracas, Venezuela, where he exhibited at the Sala Mendoza. In 1961, Alpuy arrived in New York, where he continued painting urban scenes. 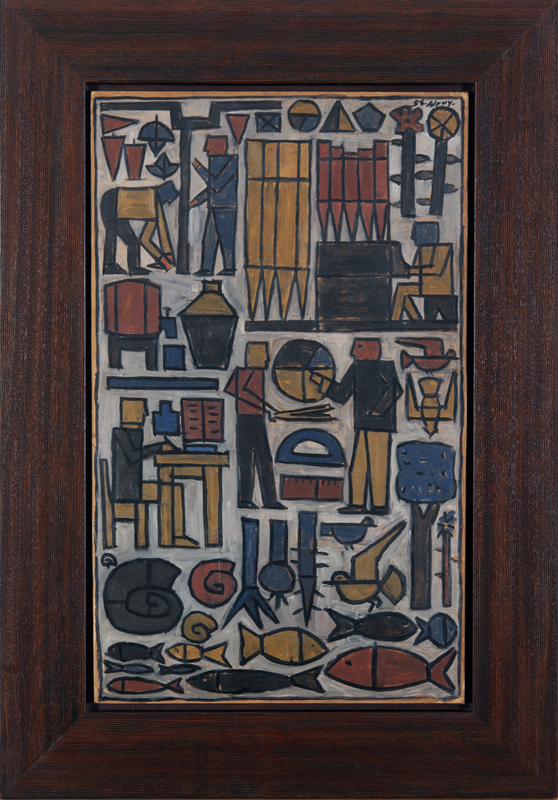 He soon realized that painting was no longer the appropriate means for his artistic progress, so he began to experiment with wood and produced a series of reliefs with references to landscapes, in which an increasing presence of symbols prevailed. Returning to Montevideo in 1964, he showed his most recent work at the Centro de Artes y Letras of El Pais. These reliefs used a variety of media, from ink drawings on wood to glass incrustations, from carved figures to incised forms. After spending several seasons in Europe, Alpuy returned to New York in 1968. With the new decade, he dabbled in wooden sculpture and exhibited at the Guggenheim Museum (New York, 1971) and the Center for Inter-American Relations (New York, 1972). In the mid-70s, Alpuy returned to painting and representing the human figure in an idealized, natural atmosphere. He exhibited his new work at the Galería Losada in Montevideo (1976). From 1979 to 1981, Alpuy moved back and forth between Montevideo and Buenos Aires, where he painted murals for the Uruguayan Embassy before returning to New York. His last works, in both painting and sculpture, were reductionist and synthetic. In the former, he returned to the theme of his earlier work with the figures now separated in fields of colors. In his synthetic work, the pieces rose as totem forms that often combined elements and ideas reminiscent of his entire artistic trajectory. Taller Torres-García- Space launched in 1943 by Joaquín Torres-García which was devoted to teaching and collective work, in line with the precepts of Universalismo Constructivo. Julio Alpuy, Gonzalo Fonseca, José Gurvich, Manuel Pailós, Francisco Matto, Sergio de Castro, Elsa Andrada, Horacio Torres and Augusto Torres were some of its members. Following the death of their master (1949) and the collective exhibition Torres-García and his Workshop (Pan American Union, Washington D.C., 1950), the Workshop pursued its activities further until it closed in 1962, although some of its members grew distant from it earlier, either temporarily or definitively.